Previous image, 47 total items. Next image, 47 total items. Save by bundling your airfares and accommodations. 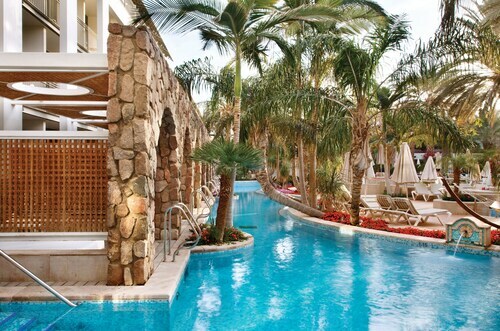 Expedia has loads of excellent Eilat vacation packages that'll simplify things and give you more money to spend! Wouldn't it be nice to save up to C$590*? Purchase a package deal on Expedia now! With more than 400 partner airlines and 321,000 properties to mix and match from on our extensive database, you won't have any problems creating your ideal vacation. You can postpone your vacation plans with us because we don't charge cancellation fees for almost all of our bookings. Can't wait for your trip to Eilat? After a few pointers about what to do when you arrive? That's what we're here for! Kite flying by the seaside is an activity the whole family can do together. If it's a breezy day, why not attempt to launch one at Green Beach? There's a fabulous range of things to keep you busy in this destination. Would you love to look at the world from way up high but too nervous to try paragliding or skydiving? Then why not go for a trek up Shlomo Mountain instead? You'll experience equally fantastic views while standing safely on terra firma! Still have time to spare? History has plenty to teach us. Drink in the knowledge and gain an insight into times past at Eilat Museum and Art Gallery. Going on a break is about so much more than just visiting a new place. It's all about the adventures you can have while you're there. 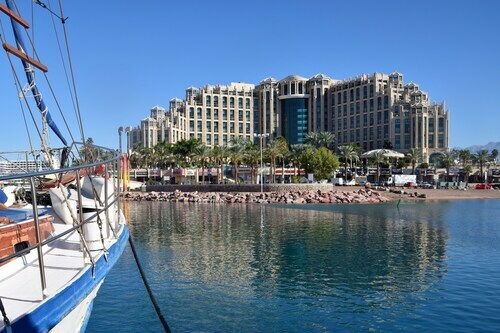 Make the most of your time in Eilat by getting into a few of its activities. Start off with a Cairo from Eilat 1 Day Tour or a Petra from Eilat 1 Day Tour. For even more options, check out our Eilat things to do page. There's nothing quite like winding down after a big day of adventures. There are approximately 88 accommodations in Eilat, so getting the perfect room for your cheap vacation or luxury getaway won't be a problem. If a generously stocked minibar and a swish bathtub appeals to you, grab a glass of wine and bathe yourself in luxury at the Royal Beach Eilat (North Beach) or the Isrotel Yam Suf (Coral Beach). 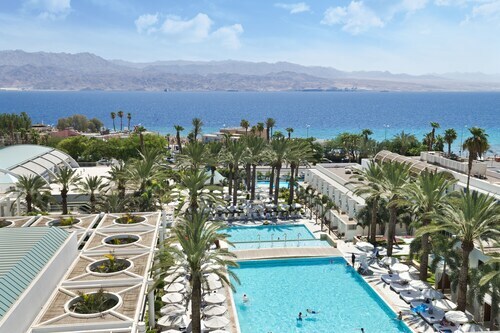 If bargain traveling's more your style, you might like the Leonardo Club Hotel Eilat - All Inclusive (Northern Shore), or the U Coral Beach Club Eilat Ultra All Inclusive (Coral Beach). If your planning on arriving by plane, you'll most likely be landing at Ovda Airport (VDA). Once you've collected your suitcase from the carousel and headed outside, the central area of Eilat will be 25 miles (40 km) away. The resort town of Eilat offers great conditions for a vacation filled with sand, sea and sun on beaches such as this one. Seeing animals in their habitat can leave a strong impression for all age groups. Interact with dolphins in a unique way at this marine attraction. Spend a day underwater without getting wet. Walk out to this observation point located in the middle of a coral reef teeming with life. For an interesting water-based experience on dry land in Eilat, survey the sterns of visiting watercraft to determine their origins. Nice property with huge pools. 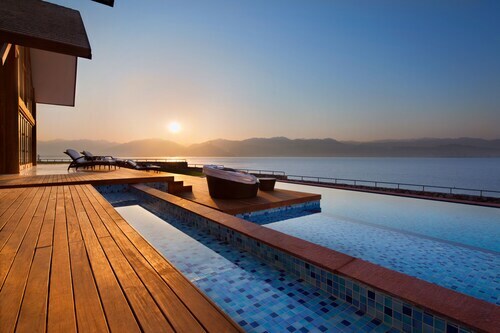 Nice outdoor furniture. The hotel was nice. A lot of kids the weekend I was there. My room was clean and large but at the back of the hotel overlooking a vacant lot. Most hotel staff were helpful. 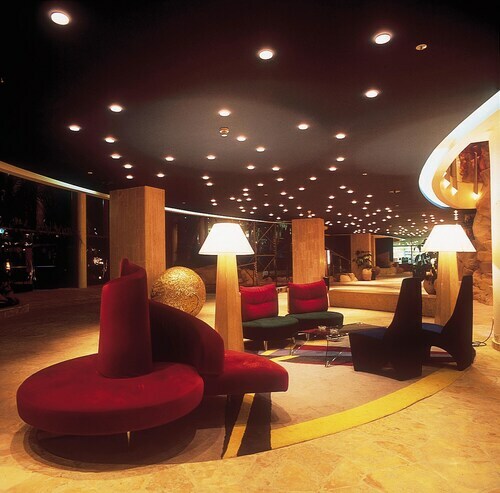 Hotel design,ambience and layout lovely/excellent. Service excellent. Breakfast superb. Location of the hotel and the views from the pool. Very good breakfast. We had a lovely stay at this hotel. 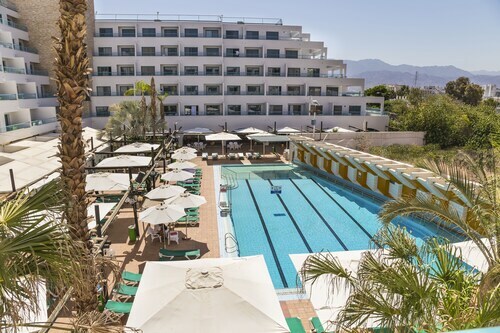 The staff are very friendly and helpful and make your stay in Eilat very easy and enjoyable, offering you tips on where to go and what to see. The pool area and food are great and the rooms are comfortable.